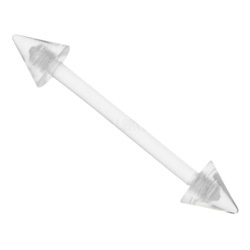 You can keep your tongue piercing in great condition by using the great range of tongue bars available, these are not only comfortable to wear but look fantastic too. There are tongue bars to suit everybody’s taste, from dazzling sparkling glitter to titanium metallic finish rave bars. By wearing tongue bars you can quickly brighten up your look and always have something to show off. 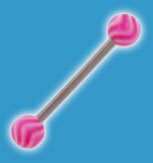 This entry was posted in Adult Body Jewellery, Fashion Accessories, Tongue Piercings, UV Body Jewellery and tagged Body Jewellery, Flexible Tongue Bars, Tongue Bar, Tongue Barbells, Tongue Jewellery, UV Barbells on September 18, 2010 by Piercing Guru. 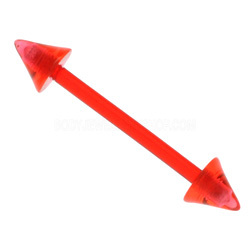 Large gauge UV barbells are a cheap, lightweight alternative to regular metal barbells. Once you get over 8mm you may find your piercings are being stretched by the weight of your barbell â€“ not a problem with UV barbells! 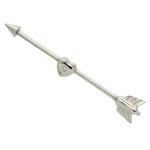 These bars are very light even at higher gauges, so you can maintain a gauge easily. They also have a nice soft feel and are very comfortable to wear. 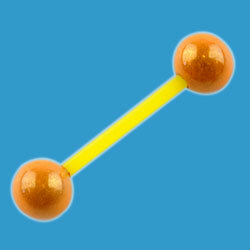 These UV ball barbells allow you to make a statement whilst still using a metal bar. They come in a great choice UV designs and you can also swap the UV balls with other jewellery to create an endless variety of UV barbells. Another great option is UV threaded balls â€“ just add them to your existing jewellery. This entry was posted in Barbells and tagged Barbells, Ultra Violet Barbells, UV Barbell, UV Barbells on July 13, 2010 by Piercing Guru. UV Barbells are bright and funky! Your UV barbell will make a statement about your piercing, wherever you are. Perfect for clubbing, festivals, parties and nights out where Ultra Violet lights are shining on you. 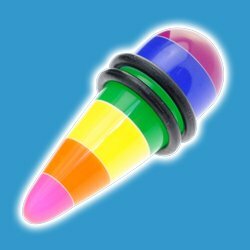 UV barbells will glow brightlyÂ with fluorescent colours under UV light, but they are also highly visible and vibrant during daylight too… so your piercings will look bright and stylish throughout the day! UV barbells are available in such a wide range of different colours and designs, there is something for all occasions and tastes. Our UV barbells are such brilliant value, you can find a choice of different barbells to keep your look updated at all times. 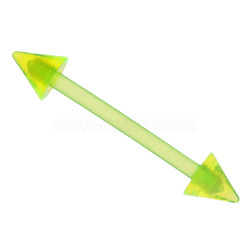 Check out our fabulous range to find uv barbells from only Â£2.45! Some of the most popular UV barbell designs to choose from include these funky silhouette UV star barbells, UV miracle barbells, UFO UV barbells, Twister UV Barbells, multi stripe UV barbells, glitter UV barbells and disco UV barbells. These funky rasta UV barbells are available with rasta balls or rasta cones on the end of the barbell stem. All of our UV barbells are made up from a G23 surgical titanium barbell stem, with two removable UV threaded accessories on both ends. The UV threaded accessories can be removed from your UV barbell so you can customize your barbell whenever you like! Mix and match different UV accessories to keep your piercings looking stylish and bright on all occasions. This entry was posted in Barbells, Glow Body Jewellery, Tongue Piercings and tagged Ultra Violet Barbells, UV Barbell, UV Barbells on June 26, 2010 by Piercing Guru.